Amanda, Eric, Jared, Britney, Annie, Braxton and Connor Hendersonare pictured with their animals, getting ready for this year’s Highland County Fair. For Eric and Amanda Henderson, getting five kids and their animals ready for this year’s fair is a lot of hard work, and a labor of love. The Hendersons moved into a larger home with farm land on Miller’s Chapel Road back in early June and are still coping with the typical post-move headaches, in addition to getting their five children, ages 6 through 14, and their animals, ready for the Highland County Fair show ring. 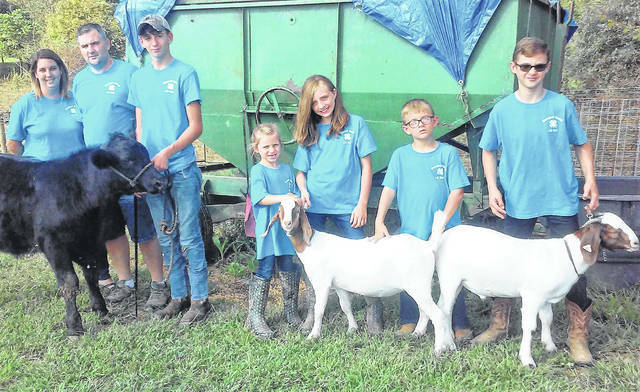 All five of the Henderson kids belong to the Barnyard Bunch 4-H Club, which according to 14-year-old Jaden, currently has upward of 40 members. “We were told we had the largest 4-H group in Highland County,” his mother, Amanda, said. Jaden is taking a pair of Angus feeder calves, named Moose and Pete, as a 4-H project this year and has plans to show them at the fair. He said the money, though, will be a nice bonus. Not to be outdone by their older brother, 11-year-old Connor and 10-year-old Annie are each taking two market goats to the fair. Connor’s goats are named Little Bit and Bessie. He started out the year raising chickens, but decided to switch to goats for the fair. Annie named her two Boer goats Tom and Jerry. For the two younger children,-year-old Braxton and 9-year old Britney, who is missing her two front teeth, there is the Cloverbuds 4-H program for children. Both Braxton and Britney will do pee-wee showmanship for goats, which is designed for the younger kids who aren’t old enough to show animals on their own. The 2018 Highland County Fair runs Saturday, Sept. 1 through next Saturday, Sept, 8.